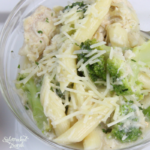 Slow Cooker Chicken Alfredo Recipe Is A Perfect Recipe For Any Day That You Need A Great, Comforting Meal To Fill You Up! We love slow cooker chicken recipes including some of our favorites, Slow Cooker Chicken, Potatoes and Carrots and Slow Cooker Chicken Teriyaki Bowls. 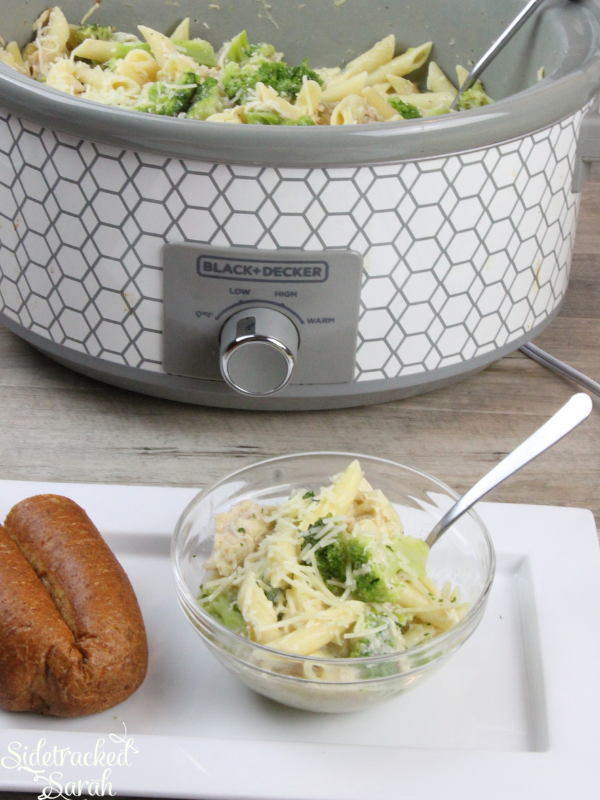 If you are looking for a delicious recipe that will fill you up but truly be comforting at the end of a long day, this Slow Cooker Chicken Alfredo Recipe will do it! 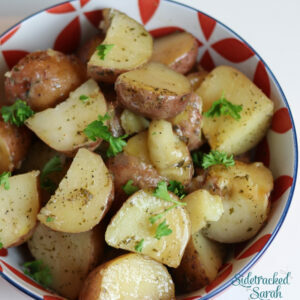 I love that this recipe is so delicious, that the family loves it but also that I can stick it in the slow cooker and be set at dinner time, even while I’m busy all day! I know that this trusty meal will always come out delicious and perfect! What If I Don’t Have Rigatoni Pasta? If you don’t, that’s ok! 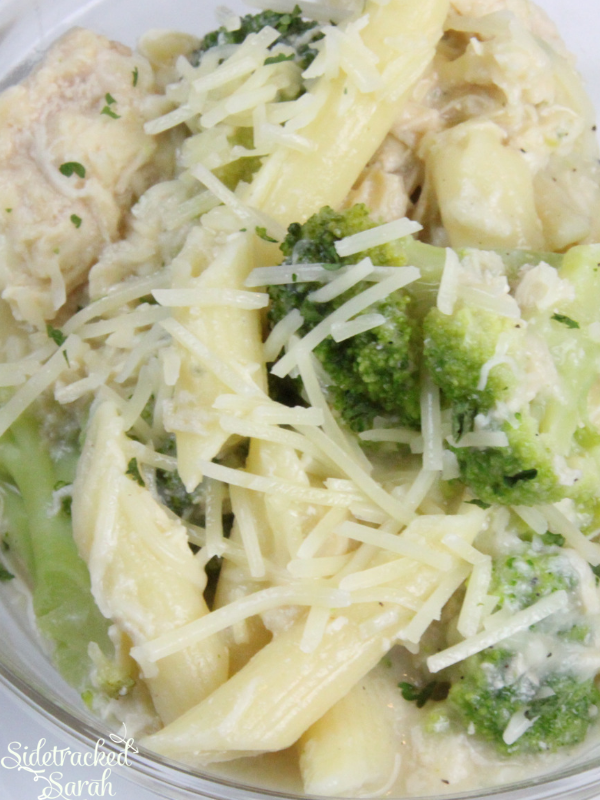 You can use any sort of pasta, but I would recommend using a thick pasta to really make this Slow Cooker Chicken Alfredo Recipe pop! Can I Add More Vegetables? Sure!! 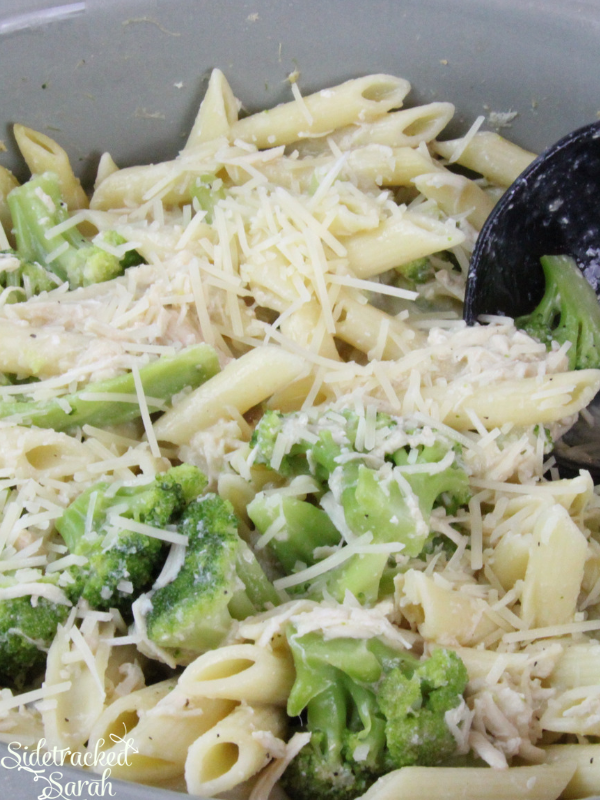 This recipe calls for adding broccoli florets, but you may want to add more vegetables to it, and that’s totally okay! You can add in some cauliflower, or even carrots to add in some of that extra flavor you may be wanting! Am I Limited To Only Parmesan Cheese? NO!! I love all sorts of cheese. You can add any type of cheese you may want to this recipe. I would recommend adding the cheese on individual plates, just because you never know what each person may want. If you want extra cheese and your husband doesn’t, then you will be good to go! Add away! Remove any fatty pieces from the slow cooker & chicken. Add chicken back in, remaining chicken broth, minced garlic, pepper, and Alfredo sauce. In a cup stir together the cornstarch and water with a fork until smooth. Pour into the mixture and stir. Pour broccoli into the top and replace the lid. Cook on high 45 more minutes. While that's cooking, boil pasta. Stir in pasta at the end of the 45 minutes. It has been an interesting last several weeks as we have gotten back into a schooling schedule. Between homeschooling, cleaning, managing several projects at once, and yes cooking, we have not found our routine yet. Its different starting school this year because my husband is now working at home and helping out with everything. It has been nice having him home and I love the help that were getting, but we are still experiencing some growing pains. It defiantly keeps life interesting though. We have to consistently keep prioritizing and re prioritizing. How do you manage your busy schedules?